Focus, determination, and perseverance are essential to just about every aspect of your life. Each characteristic is unique and together create a synergy. This is applicable to your writing for children career also. So, what are these three elements that lead to success? Focus is one’s ability to concentrate exclusively on a particular thing through effort or attention. Determination is an unchanging intention to achieve a goal or desired end. Perseverance takes determination a step beyond by using steady and ongoing actions over a long period of time to ensure its intention is accomplished. It continues on through ups and downs. These elements combined with positive thinking and projection can be an unstoppable force. I’m a huge fan of positive thinking and projection. I believe our mind has a great influence over our well being and the direction our life can take. Granted, it’s not always easy to harness that influence, but there is enough content out there, including The Secret, to at least strive to think positive and project. For example, Jack Canfield and co-creator Mark Victor Hansen, of Chicken Soup for the Soul, were rejected 144 times from publishers. Finally, in 1993, their book was accepted. Since they were in debt and couldn’t afford a publicist, they did their own promotion. In 1995, they won the Abby Award and the Southern California Publicist Award. In a teleconference I attended with Jack Canfield as the speaker, he said he and his co-author created vision boards of what they wanted. They even took a copy of the New York Times Best Selling Page, whited out the #1 spot, and replaced it with Chicken Soup for the Soul. They put copies of it everywhere, even in the toilet. They had focus, determination, perseverance, and they envisioned and projected success. The rest is history. On a much smaller scale, my daughter Robyn, practices the philosophy of The Secret. For ten years she had dreamed of being in the audience of the Oprah show. She actually got tickets twice, but for one reason or another she was unable to attend. It didn’t stop her though; she persevered and kept trying. She knew one day she’d accomplish her goal and she did. She attended O’s 10 Anniversary celebration in New York City. So, what has this to do with you as a children’s writer? Plenty. The elements for obtaining your goals are the same whether for business, marketing, life, or writing. Just about every writer has heard the adage: it’s not necessarily the best writers who succeed, it’s the writers who persevere. 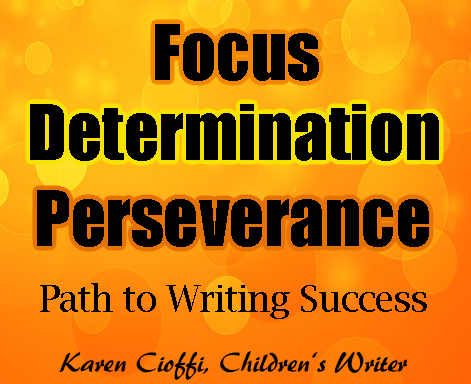 Be focused and determined on your writing goals. Have a ‘success’ mindset. This means to project success, along with taking all the necessary steps to becoming a successful and effective children’s writer. And, don’t let rejection stop you – persevere. Karen Cioffi is an award-winning children’s author, children’s ghostwriter, and author/writer online marketing instructor with WOW! Women on Writing. For tips on writing for children OR if you need help with a project, visit: Writing for Children with Karen Cioffi. Terrific encouragement. Thank you. It's not easy to be a writer--any type of writer--and especially a children's writer. Everyone reads children's books to their child and thinks, "I could write one of these." Yet the word choice and writing is hard--something few will tell you. It requires learning the craft and then working hard at it to produce something excellent. I'm a former instructor at the Institute of Children's Literature and I've written more than a dozen children's books for traditional houses. It requires what you lay out in this post--hard work and determination. Too many writers give up too soon on their work. Terry, it's so true. I applaud people who have a yearning to write and jump in and do it, but I also strongly advise they learn about writing. And if it's children's writing, there's a lot more to learn. Today, there are those who think they're given a 'pass' on quality because of self-publishing. I should have added patience in this article. Take the time to get it right!